No, we aren't up to 2,011 separate GURPS releases (yet) . . . I'm talking about GURPS supplements published in the year 2011. Playing with word order and comma placement is how editors have fun. However, this editor hopes that you have fun with some of the great content that came out over the past 12 months. Let's review, shall we? My motivations here are strictly archival, of course! I wouldn't dream of hinting that you should spend a little Christmas money to complete your collection. 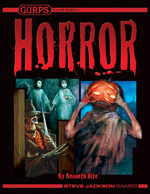 The year's most awaited item was probably GURPS Horror (also available in hardback). This GURPS classic has been greatly expanded and updated to work well with both GURPS Fourth Edition and a new decade of horror fiction. Like all scary things (if few horror-story protagonists), it didn't show up alone – GURPS Infinite Worlds: Worlds of Horror was lurking nearby. Not explicitly tied into Horror but in the same vein (that's a little vampire humor) was the all-new GURPS Monster Hunters series. This showed up as a horde of four releases: Champions, The Mission, The Enemy, and Sidekicks. Not to be outdone, an older series had some monstrous fun . 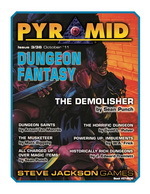 . . Dungeon Fantasy Monsters 1 came out for GURPS Dungeon Fantasy, which also saw the release of its 13th and 14th volumes, Loadouts and Psi. However, 2011 wasn't just a year of horror and monsters! 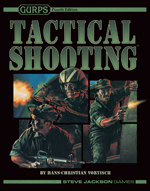 GURPS Tactical Shooting (also available in softback) and GURPS Social Engineering were both major releases, easily as big a deal as Horror. 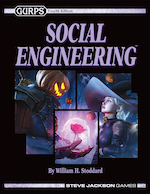 Meanwhile, GURPS Psi-Tech finished what three other psi-related works started, and GURPS Reign of Steel: Will to Live brought a classic up to date. GURPS Dungeon Fantasy and GURPS Monster Hunters weren't the only series that saw growth, either. We added GURPS Low-Tech Companion 3: Daily Life and Economics to the GURPS Low-Tech series, GURPS Powers: Divine Favor to the GURPS Powers series, and GURPS Power-Ups 3: Talents to the GURPS Power-Ups series. The Transhuman Space setting also moved forward, with Cities on the Edge, Martial Arts 2100, and Transhuman Mysteries. Pyramid provided support throughout all this. This year's issues were #3/27, #3/28, #3/29, #3/30, #3/31, #3/32, #3/33, #3/34, #3/35, #3/36, #3/37, and #3/38. We also kept plugging holes in our GURPS Classic lineup, bringing out PDF versions of the Third Edition books Age of Napoleon, Covert Ops, Faerie, and Special Ops; Ground Forces, Humaniti, and Modular Cutter in the GURPS Traveller series; Grim Legions, Hand of Steel, and Weird War II in the GURPS WWII series; and Personnel Files and Toxic Memes in the Transhuman Space series. I'll close by noting that I'm writing this recap at the start of December. By the time you read it, at least a couple more things will have been released! You can catch up on last-minute news by glancing at the New GURPS Releases block and checking out the e23: New Releases page.